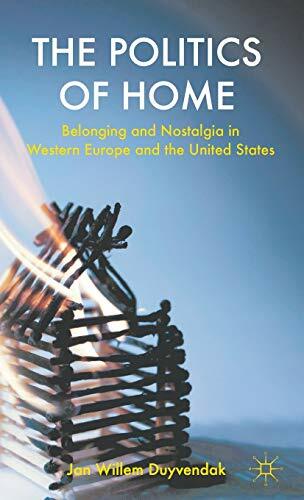 The Politics Of Home: Belonging And Nostalgia In Europe And The United: 9780230293984 Hardcover - LIMEROCK BOOKS INC. This book examines ideas of 'home' of Americans and Western&nbsp;Europeans under the influence of the two major revolutions of our times: the gender revolution and increased mobility due to globalization. It analyzes how 'home' has been politicized, as well as alternative home-making strategies that aim to transcend the 'logic of identities'. JAN WILLEM DUYVENDAK&nbsp;Professor of Sociology at the University of Amsterdam, The Netherlands.&nbsp;He&nbsp;studied sociology and philosophy in Groningen, The Netherlands and Paris, France. His work deals with various issues, including the history of political concepts, social movements, multiculturalism, social policy, and sexuality.